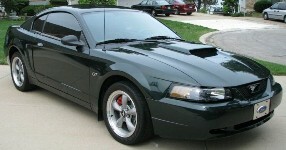 The 2001 Bullitt optioned Mustang was based on the 1968 fastback driven by Steve McQueen in the detective movie Bullitt. Bullitt modifications include unique side scoops, 17-inch American Racing aluminum wheels, a lowered suspension, modified C-pillars, special quarter panel molding, rocker panel moldings, brushed aluminum fuel cap door, special Bullitt badging, polished-rolled tailpipe, and came in Dark Highland Green and True Blue and Black. The original 1968 used in the movie was Dark Highland Green. The movie's director called for speeds of 75 to 80 mph, but the cars (including the ones containing the cameras) reached speeds of over 110 mph on surface streets. Filming of the chase scene took three weeks, resulting in 9 minutes and 42 seconds of film. During the chase scene, the Charger loses six hubcaps and has different ones missing at different times. The production company was denied permission to film on the Golden Gate Bridge. 2001 Bullitt Green Mustang GT Bullitt with a 270hp, 281 cubic inch, 4.6 liter, electronic fuel injected, single overhead cam, V8, special Bullitt engine. Ford had a Bullitt optioned 2001 Mustang which was based on the 1968 fastback driven by Steve McQueen in the detective movie Bullitt. Bullitt modifications included unique side scoops, 17-inch American Racing aluminum wheels, a lowered suspension, modified C-pillars, special quarter panel molding, rocker panel moldings, brushed aluminum fuel cap door, special Bullitt badging, polished-rolled tailpipe, and came in Dark Highland Green and True Blue and Black. The original 1968 Mustang fastback used in the movie was Dark Highland Green. The movie's director called for speeds of 75 to 80 mph, but the cars (including the ones containing the cameras) reached speeds of over 110 mph on surface streets. Filming of the chase scene took three weeks, resulting in 9 minutes and 42 seconds of film. During the chase scene, the Charger loses six hubcaps and has different ones missing at different times. The production company was denied permission to film on the Golden Gate Bridge. Highland Green 2001 Mustang GT Bullitt with the Police Interceptor, 270hp, 281 cubic inch (4.6 liter), single overhead cam V8. Bullitt modifications included unique side scoops, 17-inch American Racing aluminum wheels, a lowered suspension, modified C-pillars, special quarter panel molding, rocker panel moldings, brushed aluminum fuel cap door, special Bullitt badging, polished-rolled tailpipe, and came in Dark Highland Green, True Blue and Black. Ford optioned this 2001 Mustang to resemble the 1968 fastback driven by Steve McQueen in the detective movie Bullitt. This Bullitt example was also our Attitude Of The Week for 11-04-2007. This is the 2001 Mustang GT Bullitt hero promotional card. This car measures 8.5 by 11 inches and is folded to allow for 4 pages of print. Hero cards started with racing drivers and their cars and have been extended to promote sport cars from various manufacturers. This one features the first year of the Bullitt Mustang feature car which commemorates the 1968 fastback driven by Steve McQueen in the detective movie Bullitt, the scenes of which are shown at the top. In 2001, Highland Green was reserved only for this model; although the 2001 Bullitt also came in Black and True Blue. The original 1968 movie Bullitt Mustang was painted in 1968 Highland Green.